Fall Shredded Brussels Sprouts Salad is a crispy, crunchy, healthy entree salad recipe that’s full of fresh fall flavors! Is it crazy to be thinking about Thanksgiving meal planning already?? I know it’s not even Halloween yet (Lincoln’s going as dunna-nunna-nunna-nunna-dunna-nunna-nunna-nunna (did I get them all?) BAT-MAN! Aka the only remaining costume at Target aka Mama’s a little behind in the trick-or-treat department this year. In a perfect world he’d go as his idol Curious George, but in reality this is Ben’s child we’re talking about so the costume will stay on for 24 seconds before being ripped off. Therefore it’s, dunna-nunna-nunna-nunna-dunna-nnuna-nunna-nunna BAT-MAN! << longest parenthetical sentence ever,) but I took one bite of the Fall Shredded Brussels Sprouts Salad I’m sharing today and Thanksgiving side dish immediately came to mind. Friends? I am DYING over this crispy, crunchy, fresh and healthy salad full of All The Goodness. 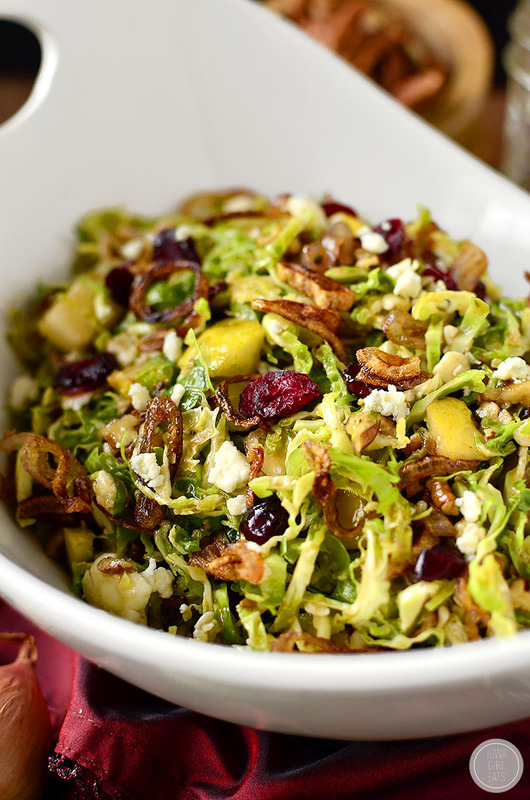 Brussels sprouts salads are a VERY good thing! I’ve had a fall-themed shredded brussels sprouts salad on my radar for a few months now but I couldn’t seem to get the topping combo to mesh in my mind. To cheese or not to cheese? To nut or not to nut? To fruit or not to fruit? The answer? To cheese, to nut, to fruit, and to CRISPY SHALLOT. Am I making any sense here? Don’t answer that. This salad is sensational. 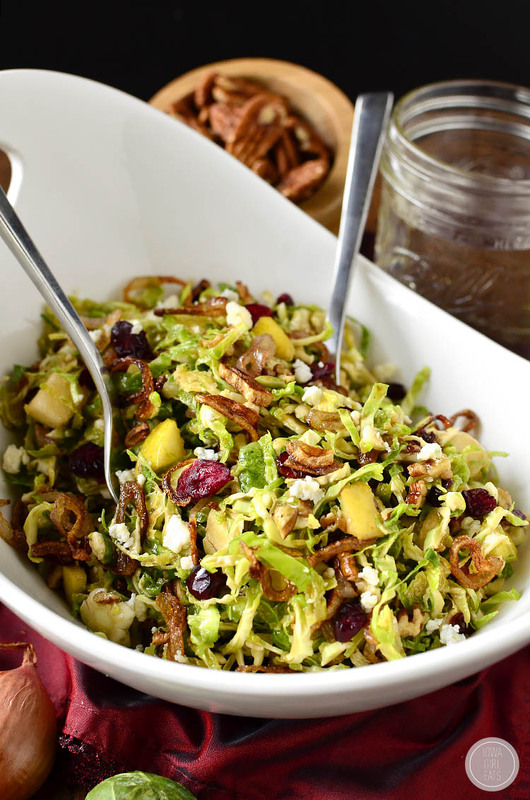 Finely shredded raw brussels sprouts lend a deep crunch to this filling salad that’s full of dried cranberries, crumbled gorgonzola cheese, chopped pecans, fried shallots, and fresh pears – drizzled in a 30 second Maple Balsamic Vinaigrette. Savory, sweet, crispy, crunchy, fresh, easy, hearty, feel good food! I had this salad two nights in a row last week, as it’s very filling and most importantly extremely satisfying, but like I mentioned, it’s going to steal the show at your Thanksgiving dinner table. Party Potatoes Deluxe? Your competition has arrived! Start with 12oz fresh brussels sprouts. Brussels sprouts CAN be eaten raw – they’re basically baby cabbages. 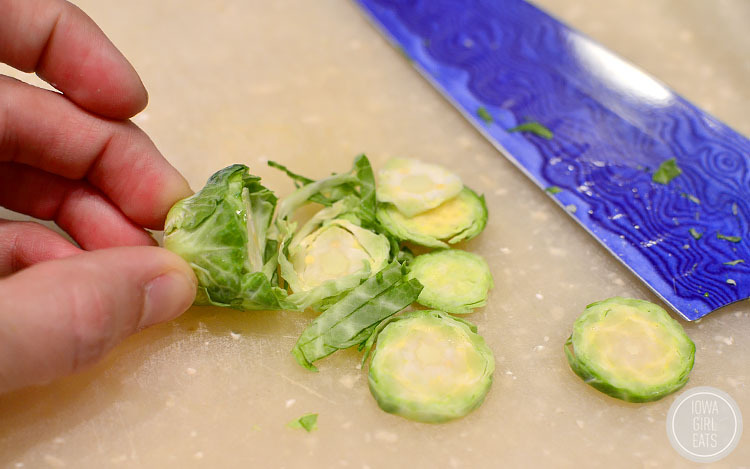 Peel back any tough outer leaves from the sprouts then very thinly shred with a sharp knife. I’ve used the slicing disc on my food processor to thinly slice brussels sprouts before, but a sharp knife is the best way to finely shred vs slice. 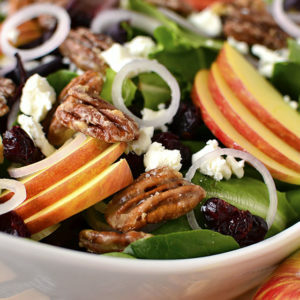 Place the shreds in a big bowl, then add all the goodies: chopped pear plus 1/4 cup dried cranberries, 1/4 cup crumbled gorgonzola cheese (use feta or chevre if you’re not feeling gorgonzola) and 1/4 cup chopped pecans. 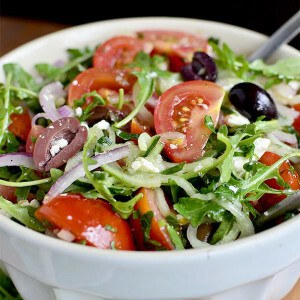 In a jar, shake up the Maple Balsamic Vinaigrette which is just 2 Tablespoons each extra virgin olive oil and balsamic vinegar, 1 Tablespoon pure maple syrup (not pancake syrup,) 1 teaspoon Dijon mustard, salt, and pepper, then pour it over the salad and toss to combine. This slightly sweet and tangy dressing is the perfect way to wrap all these ingredients together deliciously. 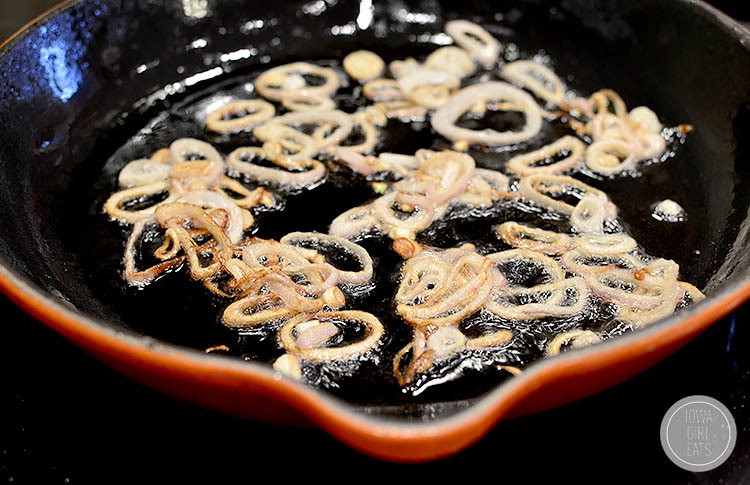 Last step is to pan fry 2 jumbo sliced shallots in 3 Tablespoons extra virgin olive oil. These shallots totally make the salad! Their crispy crunchy and decadence add a huge flavor boost. Definitely do not skip. Add the shallots to the salad, give it one final toss, then serve to eagerly awaiting forks! New Iowa Girl Eats Blog Tour! 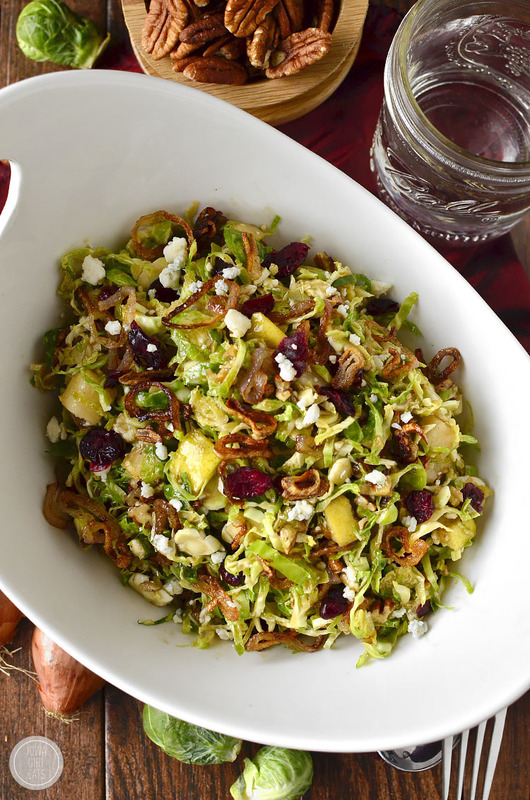 Fall Shredded Brussels Sprouts Salad is crispy and crunchy, and full of fresh and savory flavors! 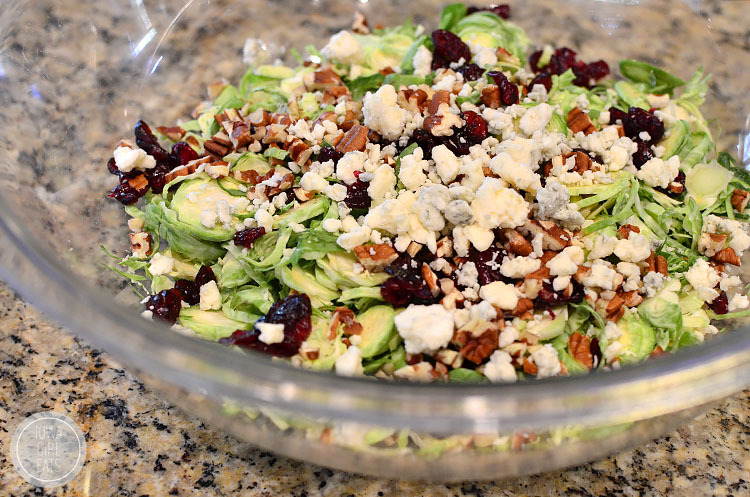 Using a very sharp knife, thinly shred brussels sprouts while holding onto the core end then discard cores and add shredded sprouts to a large bowl with dried cranberries, pecans, gorgonzola cheese, and chopped pears. Set aside. Heat extra virgin olive oil in a skillet over medium-high heat. Add half the shallots then fry until light golden brown, 1-2 minutes. Scoop onto a paper towel-lined plate to drain then repeat with remaining shallots. Sprinkle with salt then let cool slightly. Add ingredients for Maple Balsamic Vinaigrette together in a jar then shake to combine. Pour over salad then toss to coat. Add fried shallots then toss to combine, and then serve. I recommend shredding your own brussels sprouts vs buying pre-shredded to make sure you can slice them very, very thin! Not only is this salad great for everyday dinner or lunch, and the holidays, but it’s perfect to bring to a potluck. Since the shredded brussels sprouts are heartier than lettuce, they stand up to being dressed much longer. 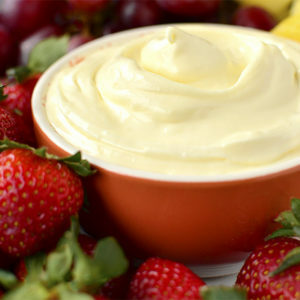 Whenever and however you serve it – enjoy! NEXT: New Iowa Girl Eats Blog Tour! Oh wow, those onions sound incredible!! 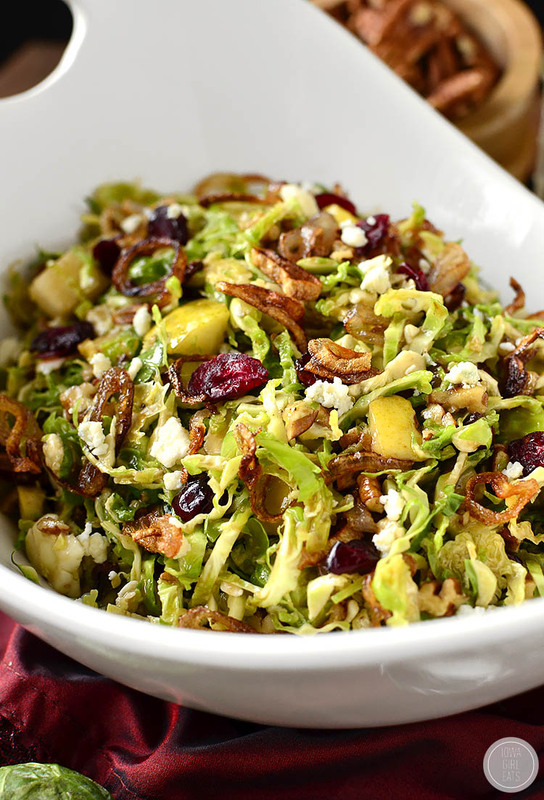 I love brussels sprouts in salads and the crispy shallots make this one a winner. Printing and pinning! Thanks for the great recipe! 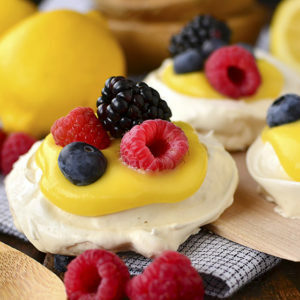 Oh, this looks so yum! I just had to pin it and make it later. It’s perfect for fall. I wonder what to serve it with, though. Any good ideas? YES YES YES! 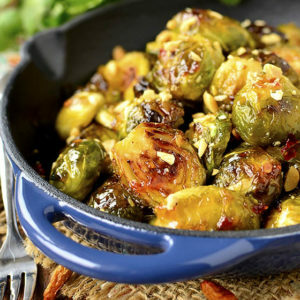 This looks and sounds like brussels sprouts heaven! A perfect vegetarian dish, but what about the almost additional of BACON!?! Thanks for sharing your perfection. Salads don’t usually make my mouth water so much. Awesome recipe! Will need to make this next week. I LOVE brussel sprout salads! So Good. And with fried shallots…yum!! Wow, I’ve never thought of brussel sprouts as salad, amazing! I love that Brussels sprouts are so popular now! They are too delicious to be pushed away like they were for so many year. This looks delicious. if it’s not pancake syrup , what kind of maple syrup? BTW, Trader Joes sells bagged shredded Brussels sprouts. 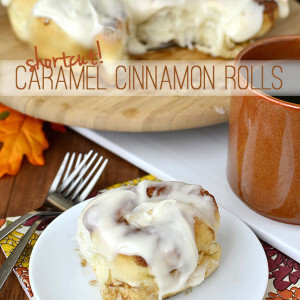 You are so right–this will make a terrific addition to the holiday menu!! This looks delicious! Perfect for the holidays! This salad is lip-smackingly delicious! I had it for lunch yesterday and just ate it for breakfast. Thanks for posting great eats. Love it! So glad you enjoyed! This was absolutely delicious! I had it with Bourban marinated pork chops and threw some left over chicken on the salad the next day. Amazing! Looks like someone already mentioned that Trader Jo’s has pre sliced Brussels sprouts which made this recipe so easy. That you for your great website. I’m a Nebraska girl transplanted to New Mexico 32 years ago. Your website gives me a little taste of home! Oh wow, bourbon-marinated chops – YUM!! What else was in your marinade? 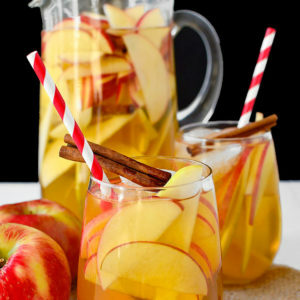 Kristin, this looks amazing! I love brussel sprouts, especially this time of the year. I am just starting out my food blog and have been reading your blog for years (I even emailed you before I studied abroad in college!) I just posted a Gluten-Free quiche recipe I really think you would enjoy, another great meal as the temperatures drop! This looks AH-MAZING and definitely going to make it as a Thanksgiving side. Do you think I could make it a day ahead and store in the fridge then cool to room temp? Or is it best served warm? Hi Becca! I’d combine the brussels sprouts, nuts, and dried cranberries in a bowl/container the day before, then just before serving toss with the cheese, crispy shallots (made fresh just before serving,) pear, and dressing! Some of my best salads have come from you, this is no exception. Just finished it, delish! Oh my goodness that looks so good! 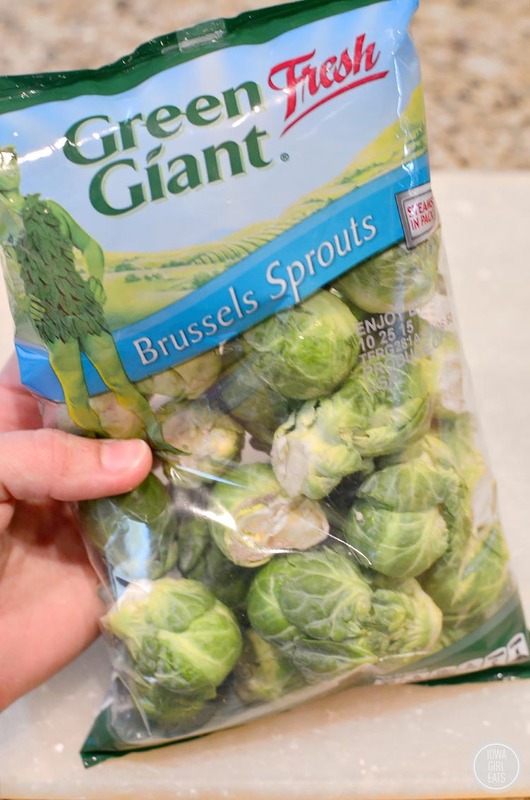 Are the brussels sprouts firm and hard to eat? Nope, they’re really crunchy but not hard to eat if you shred them thin enough! Fantastic salad!! I got everything at Trader Joes, using their bag of Cruciferous Crunch Collection (kale, brussel sprouts, broccoli, green & red cabbage). No way was I going to slice up brussel sprouts when this was readily available! I followed the recipe exactly except I used Agave syrup instead of maple in the dressing. Next time I will add more dried cranberries & Gorgonzola just because I love them. I didn’t think the pears added much to the salad, so I may leave them out. So Super DELICIOUS! Thank you for the recipe! Just made this tonight. YUM! I used my food processor to shred the Brussels and I used blood orange infused olive oil in the dressing. We had this today at our Charming Chicks luncheon. Fantastic salad! I will make it for Thanksgiving. Thank you! Is there another cheese you would recommend instead of gorgonzola. I am not a gorgonzola fan… Or just leave the cheese out? I would use chevre or feta! I was going to do roasted brussels for Thanksgiving, but now I think I am going to change it up and do this salad instead. It looks delicious! 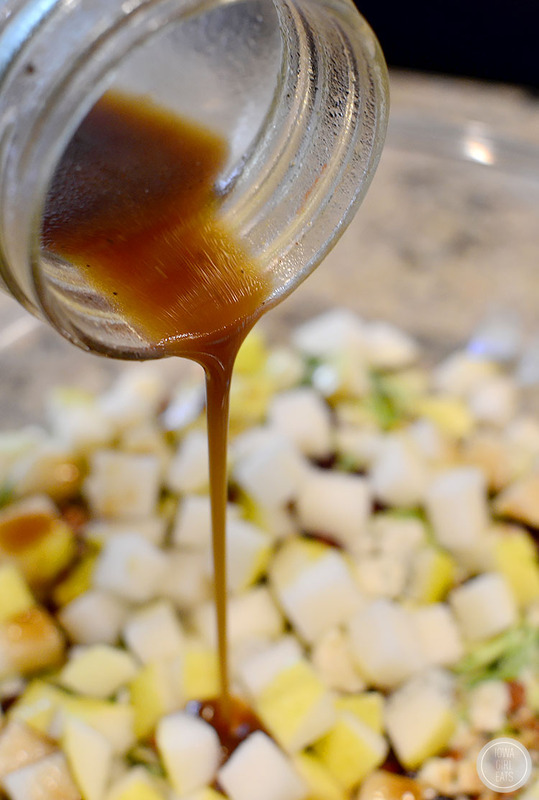 Love the idea of adding some maple to the balsamic dressing. Going to try this recipe tomorrow for Thanksgiving, looks AMAZING! Do you think I could sub goat cheese and almonds for Gorgonzola and pecans? Just wondering if that combo would taste ok? Also, does it matter what kind of pear I use? I am by no means a cook at all! Totally! I hope you love it! 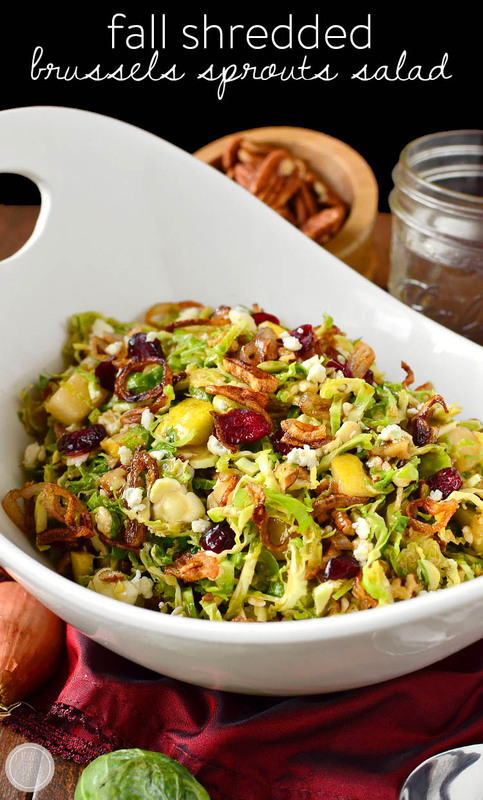 Kristin, i.just happened to Google brussel sprout salad tonight and found this recipe. I LOVE it. I was looking for something a little diffrent tonight front my normal bs, carrot, red cabbage with evoo and apple cider vinager. This was amazing and reminded me of something I used to make with muslin greens. I just didn’t have any onion/shallot because they happend to all be in my French Six Onion Soup (6 types of onion) on the stove. Next time there will be fried shallot. Should be even better…now I’m off to browse the rest of your blog sence I’m new. Thank you for sharing. That French Six Onion Soup sounds awesome! I made this as the healthy addition to Thanksgiving this year and everyone went crazy for it. I have now been assigned to bring it to all thanksgivings and Christmas celebrations. My mom makes it once a week for her lunches as well. Thanks for this delicious salad! Awesome Salad!! Looks and tastes great!! I jus recently discovered that I like Brussels sprouts (as in last week!). I had seen this recipe when I was searching for how to make roasted sprouts and thought if I liked them is have to try it because it just looked so beautiful. I made this for our weekly fellowship gathering and it really was delicious! I had to make 2 substitutions so I can’t wait to make it as written – I didn’t have shallots so I used green onions (not fried, of course), and I thought I had dijon but it was honey mustard. I also went with feta since I don’t care for gorgonzola. It was still a wonderful salad and I’m also having it for breakfast! Thanks for the great recipe!